Corns and calluses are caused by pressure on the skin of your foot. They may occur when bones of the foot press against the shoe or when two foot bones press together. 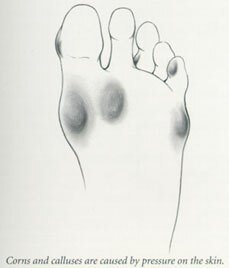 Common sites for corns and calluses are on the big toe and the fifth toe. Calluses underneath the ends of the foot bones (metatarsals) are common. Soft corns can occur between the toes. Treatment involves relieving the pressure on the skin, usually by modifying the shoe. Pads to relieve the bony pressure are helpful, but they must be positioned carefully. On occasion, surgery is necessary to remove a bony prominence that causes the corn or callus.